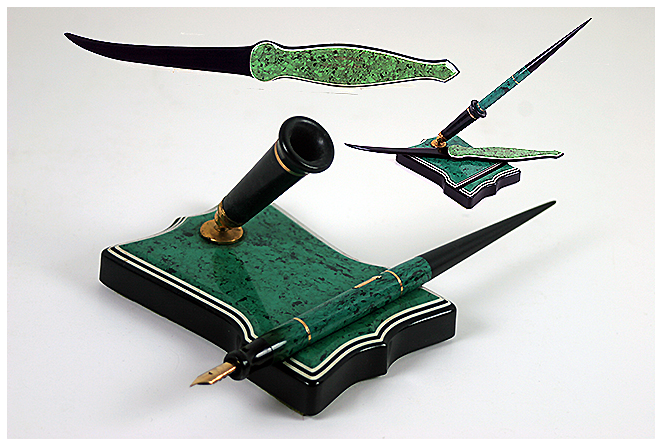 This beautiful 1930 Conklin Endura Desk Set in Jade is a great set. The base is a 3″ x 4″ x 3/4″ geometric shape with white and black edges and a black trumpet. The lever-filler desk pen is a matching piece, also in Jade, with a black taper. To make this set even more complete and perfect for your desk, there is a matching Conklin ”Knife” letter opener. Note the color is a little lighter than the set, indicating it is a slightly later piece. Interestingly, the desk pen has two narrow gold-filled bands rather than inlaid color bands. The pen has an extra-fine/fine nib – perfect for jotting notes and every day use. Item #20 in Catalog #77 – available!